As a New Yorker, my window air conditioner unit is a useless, drafty eyesore for more than half the year. One day I conceived the idea of not only insulating my apartment for the winter, but also dressing up this focal point. Our whimsical collection of quilted, thermal double insulated air conditioner covers for window units are designed to do just the same for your home! Now you can reclaim your window in colder months and express yourself with one of our seasonal or fashion designs. 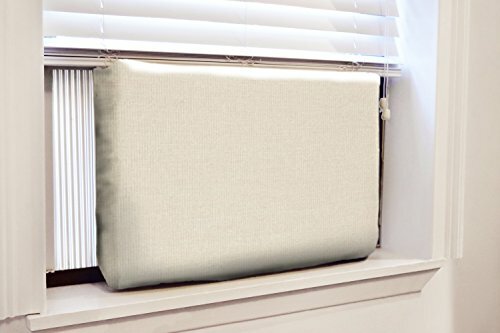 DIMENSIONS: Fits window air conditioner units 24"W x 4"D x 15"H and up to 28"W x 20"H.
DOUBLE INSULATED AIR COVER: Proprietary thermal double insulation blocks cold air drafts, noise, moisture, light. HEAVY DUTY: Insulate your home during Winters to make it more energy efficient. PREMIUM INDOOR COVER: Not only keeps out dust, dirt and noise but also makes your air conditioner look good. Made in USA. MAINTENANCE: Do not wash. Dry clean only. If you have any questions about this product by Gerrard Larriett Aromatherapy Pet Care, contact us by completing and submitting the form below. If you are looking for a specif part number, please include it with your message.